Being a Blogger Brand Ambassador has come with a wide variety of diverse campaigns and fun experiences. The chance to try out products that I might not have known about otherwise, as well as unique in store opportunities and events. 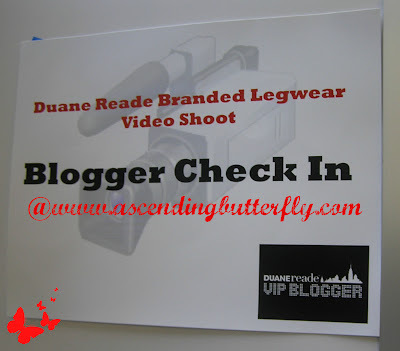 I recently had the opportunity to participate in a campaign surrounding Duane Reade's (which is owned by Walgreens) newest seven-week social media campaign to raise awareness of Duane Reade-brand hosiery products produced by Doris Hosiery Mills. (And if that name sounds familiar ladies, Doris Hosiery Mills also makes the pricey hosiery you see in many department stores!) The campaign which commenced at midnight November 18th, will run through January 7, 2013. Behind the scenes shot of all Five Bloggers walking toward Duane Reade! Far Right: Ascending Butterfly in the Green Jacket! We were being filmed walking toward the store and this is a candid shot of us as we were being filmed. To kick off this campaign, 5 NYC Duane Reade VIP bloggers were selected for a style makeover with Jess Zaino (Style Expert regular on Biography Channel's Fashion Groundbreakers, TV Guide Network's Fashion Team and creator of Cheap Chic Shopping Tours) to help them achieve 5 distinct looks using Duane Reade brand hosiery products (and achieving the look for less than $100), and I was one of the bloggers selected to participate in this campaign. 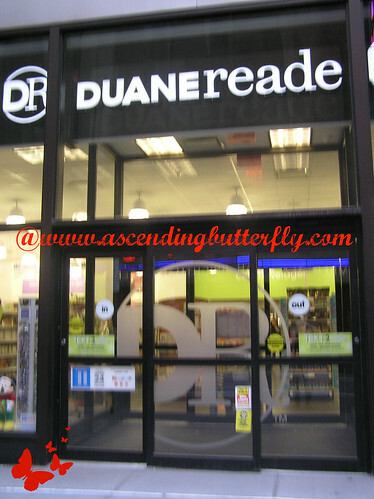 This Duane Reade location is central to Radio City Music Hall, a very popular NYC destination for both tourists and locals! This was my second time on camera in a very short period of time during the same week and I never really realized how long it takes to film what amounts to a very short amount of time actually on air! It was a pretty intense day. Unfortunately, I ultimately was not actually styled by the stylist, and personally don't think I'd ever even want to put myself in a stylist's hands ever again, but I did enjoy learning about the new legwear and hosiery at Duane Reade! It feels like we skipped Fall and went straight into Winter here in New York City, with long Sweater dresses I always love to wear tights, and for me the fact that I can now pick them up at my local drugstore is a huge timesaver for me! The more I can buy in ONE store in just ONE shopping trip the easier it is for me. Let's just say that time has definitely NOT been my friend lately! I did leave the experience with a new pair of Duane Reade Legwear and as soon as I get the chance to wear them I'll take a picture of me wearing them, but it's been all pants for the past few weeks, and with impending snow in the next few days I think I'll be in pants all week this week too! Last week I found a great new eco friendly printer paper at my local Duane Reade, and this week I discover they have great hosiery too, from the day-to-day, to a night-on-the-town, Duane Reade really has you covered! I'm still on the hunt for the perfect sweater dress to pair with my new tights! I also learned that not every stylist is cut out to style a curvy frame and it's really OK to be yourself and just say No when something doesn't work for you. I don't think I get the point yet of a stylist, we spend what feels like a lifetime getting away from our parents dressing us so we can be our own person, I'm not sure I see the point of having someone else try to mold me in their idea of what my body type should wear. Maybe at some point I'll feel differently. But since I spent this afternoon on the phone with Gerard Butler (Yes Ladies THAT Gerard Butler!) I'm floating on a butterfly happy cloud! You can check out the rest of the photos from this shop on our Pinterest Board or on Google Plus! Butterfly, Have you tried the new Duane Reade Branded Legwear/Hosiery yet? If so, what do you think of it? Have you ever relied on a stylist? If so, How was YOUR experience? If you do decide to enter please let us know here so we can vote for you! FTC Disclosure: I am a member of the Collective Bias® Social Fabric® Community. This shop has been compensated as part of a social shopper insights study for Collective Bias™ and Duane Reade #CBias #SocialFabric All opinions are my own!